The following are resources to enhance your experience at Future Building and to help spread the word! Available to download in English and French. various trades available for apprenticeship. Official promotional poster for Future Building 2018. Available to download. 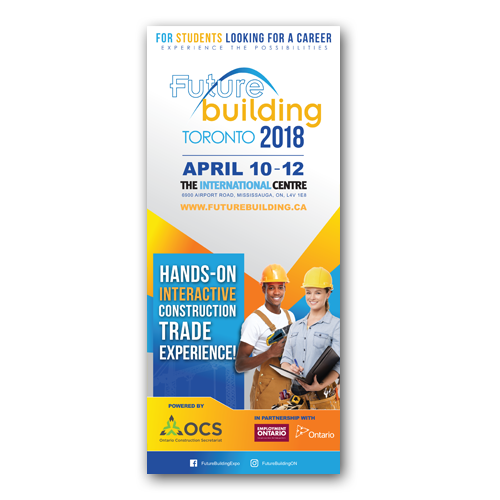 Promotional card for Future Building 2018. Available to download. Information about the event and descriptions of the various trades available for apprenticeship. Available to download. 2018 Booklet features information on trade entry requirements, apprenticeship program details and average union hourly rates/wages. Available to download in English below. Official promotional poster for Future Building 2017. Available to download in English and French. Promotional card for Future Building 2017. Available to download in English and French. Information about the event and descriptions of the various trades available for apprenticeship. Available to download in English and French. Information letter for teachers, counsellors and attendees - May 2, 2017. Available to download in English and French. 2017 Booklet features information on trade entry requirements, apprenticeship program details and average union hourly rates/wages. Available to download in English below. 2017 Booklet features information on trade entry requirements, apprenticeship program details and average union hourly rates/wages. Available to download in French below.